Palestinians living near the village of Duma in the occupied West Bank district of Nablus have been told that the sole water pipeline servicing the area will be removed by Israeli occupation forces as it was deemed “illegal”. Palestinian news agency Wafa reported that Ghassan Daghlas, a Palestinian official who monitors Israeli settlement activity in the northern occupied West Bank, said that Israeli forces had informed the residents of their intention to remove and destroy the pipeline. Daghlas said that the pipeline is the sole water source for the area. According to Wafa, 14 Palestinian families live in the area and depend on the pipeline. 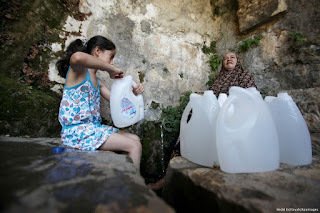 However, rights groups have long reported that Israel’s control of water resources in the occupied West Bank has led to water shortages in Palestinian communities which force Palestinians to buy water directly from Israel. Palestinians are prevented from digging their own wells or other projects to enhance water access.